Jayden Bogle has impressed since stepping up from academy football. 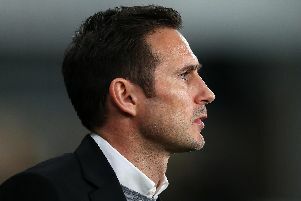 Derby County boss Frank Lampard has paid tribute to the talent coming through the Rams' youth system. Several members of the U18 and U23 squads have stepped up to train with the first team since Lampard's arrival, with 18-year-old Jayden Bogle having gone one step further and become a first team regular at right back. And Lampard is thrilled to have such talent at his disposal. He told RamsTV: "The youth teams have been playing so well and winning so many games. I’m always trying to get across that myself and my staff, we are a group here. Lampard is keen to see Bogle's example prove to be an inspiration to others of a similar age, with Max Bird having also made appearances in the Carabao Cup and been on the bench for the Aston Villa game. “That’s all down to them and how they take things on board. Hopefully we will have more to come through. “The first-teamers actually react well to having them too because they bring in the youth and the energy into the training session, which I think is good.